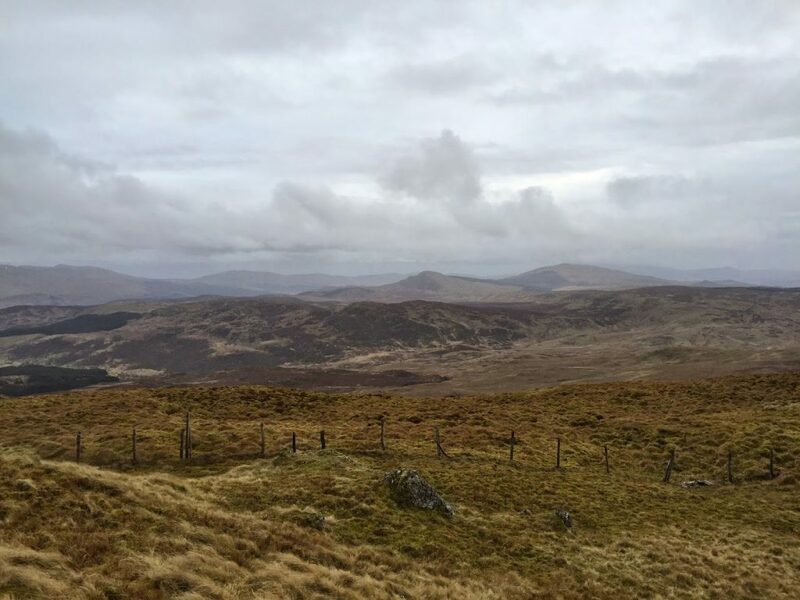 No wonder I saw no other soul in 24 hours – the foothills of Arenig Fawr are a pathless, tussocky bogfest that sap the life and energy from your limbs with every squelchy stomp! The weather forecast had been less than encouraging but a bright blue sky in London teased a perfect winter morning, so all packed I headed up the M40 – destination Bala. The fine weather continued till, well, till I reached Bala. It wasn’t bad but the blue sky had been replaced by grey cloud enveloping the surrounding hills and the wind has started to pick up. After grabbing some provisions I headed up through the hamlet of Parc to a small lay-by at the end of Cwm Tylo. This would save me a few kilometers. A quick decision on whether to take the Hex Peak inner or a bivvi bag saw me grab the inner for the extra warmth and shelter. 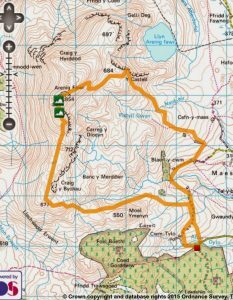 My Viewranger 1:50k map didn’t show any footpaths so I followed a farmers track bearing north-east before turning west. I then traversed the northern flank of Moel Ymenyn, broadly following the line of Dolwyd Bychan which trundled down the valley below. My feet were soaked within moments and the pathless ascent through tussocks and heather weighed heavy on my legs after the four-hour drive. A short pull up to the head of this minor valley led me to flatter ground dotted with pools and more bog. Viewed opened up across to the Aran ridge and the shapely peaks of Rhobell Farr and Duallit to the south. The south ridge of Arenigs Fawr was to be my destination for the evening. The wind was picking up and I was consciously taking note of any possible sheltered camping spots lest the ridge was too exposed, but in such a featureless plateau descent would likely be the only option. Another steep pull up led me to the south end of the ridge and the first of the many pools of Llyn Crafanc. A kilometre further north the main summit could just be seen rearing out of the mist. The wind was howling from the west so some shelter for camp was a must. Heading north I picked my way around the various pools and bogs, feet soaked, seeking out each craggy outcrop for a sheltered, flat and dry spot. 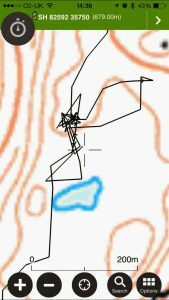 After much searching (my Viewranger track, left, looked like the scribbles you get on paper when trying to get a biro to work) I settled on a spot behind a crag, just north of the main pool. It was somewhat sheltered and relatively flat and dry and clearly a favourite spot for the local sheep, the grass having been kindly flattened. With darkness falling I pitched the Hex Peak tent as quickly as the temperature was dropping. Popping back to the main pool to fetch some water I cursed myself for freezing my hands attempting to fill the bladder for my Sawyer filter. I normally find it fills easiest by dragging it through the water, but that led to freezing hands made worse by a bitingly cold wind. A moment of logic had me scouping water up in my Titan kettle and pouring the water into the bladder. I can see how cavemen learnt by trial and error! Winter evenings are notoriously long…and cold..and damp. I boiled water for a cuppa-soup hoping to regain some warmth, while I organised the tent and removed my soaking shoes and socks. It was the first time I’d used my new Kovea Spider stove and whether it was the temperature or me being used to my Jetboil I was disappointed how long it took to boil. The chicken and vegetable soup was completely tasteless, which was surprising as it seemed to infuse the cup and every drink thereafter tasted of chicken soup. The forcast had warned of higher winds and gusts up to 60mph but whilst I could hear the wind outside, the crag protected me from the worst. After dinner – an Expedition Foods goulash which has the consistency of baby-food but is surprisingly tasty – I snuggled into my sleeping bag, listened to some music and then read a couple of chapters of Mike Cawthorne’s excellent One Hell of a Journey, his account of completing the Scottish 1,000m peaks in a single trip over a winter. It felt rather apt to be reading it within the confines of cold, damp tent – I just needed to awake to 6 inches of snow to really feel at home. Inside the tent the temperature dropped to 2 degrees but I was cosy wrapped in my sleeping bag. 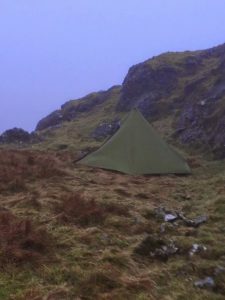 About midnight the wind picked-up noticeably and the tent was being buffeted by the gusts as they swirled around the crag. I could hear each distant roar growing louder until each gust arrived with a violent shake of the tent. The pyramid shaped Hex Peak held its ground, the single pole dancing a merry jig in the centre allowing the tent to flex every which way. After a restless night I awoke to a gently pervading light and the sound of a light shower bouncing of the flysheet. The wind was still strong and I was enveloped in cloud so was in no rush to move. A quick recc’y of the tent showed that one guy-line had slackened off during the night and my walking pole had sunk into the ground an inch or so, so the fly wasn’t quite as taut as when she was pitched. Arenigs Fawr’s summit had disappeared in the damp mist and a torrent of damp air was being ferociously channelled up a gully just ahead of me. I contemplated my plans for the day. My loose idea of exploring the badlands to the south would be no fun in this weather- between the peaks it’s mostly bog, heather and more bog. A loop north over Arenig Fawr in the mist would lead me towards Llyn Areng Fawr and then across rough country back to the car. If the winds were too strong I could always stay put for the day, as Mike Cawthorne did when conditions meant he couldn’t ascend. By 0830 the wind had abated a little, to be replaced by more showers. I was in no rush, I had my chicken-flavoured tea to savour and I started to write this blog post while cocooned in my sleeping bag. Instant porridge warmed me up and I decided that I had to bag Arenig Fawr while I was here, even if visibility was zero. A snowy Arenig Fawr summit! I packed my gear and strapped a soaking flysheet to the side of my pack. I couldn’t face putting on wet socks so opted for Seal-skinz to keep my feet dry. Compass and bearing was needed in the poor visibility, aided by a fence-line which ascends the ridge to the summit. 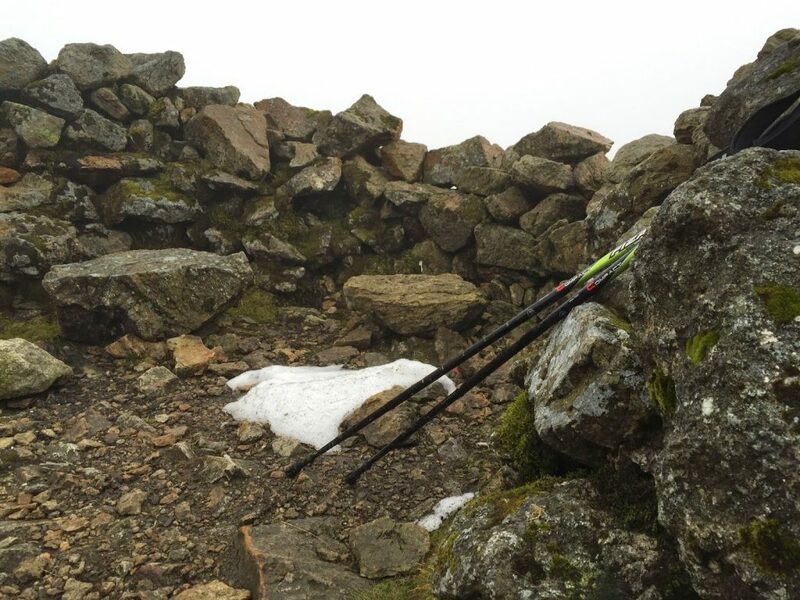 I passed a few remnant of snow clinging to the eastern slopes and soon reached the summit cairn surrounded by a stone wind-break. The summit is also home to a commemorative plaque to airmen killed when an american Flying Fortress crashed into the mountainside in 1943. Descending north-west I used compass and pacing till I picked up a feint path. As I dropped altitude there was a short break in the cloud affording views across the moorland below. I headed over to the cliffs above Llyn Arenig Fawr for a quick lunch stop by which time I was below the cloud. The rain re-started and kindly accompanied me down through the tussocky bogs and over pathless fields until I reached better tracks and the return to my car. It hadn’t quite been the perfect winter weekend I’d longed for (blue-skies, snow-capped peaks….) but it was good to get in some hill-time and finally visit the wild Arenigs. 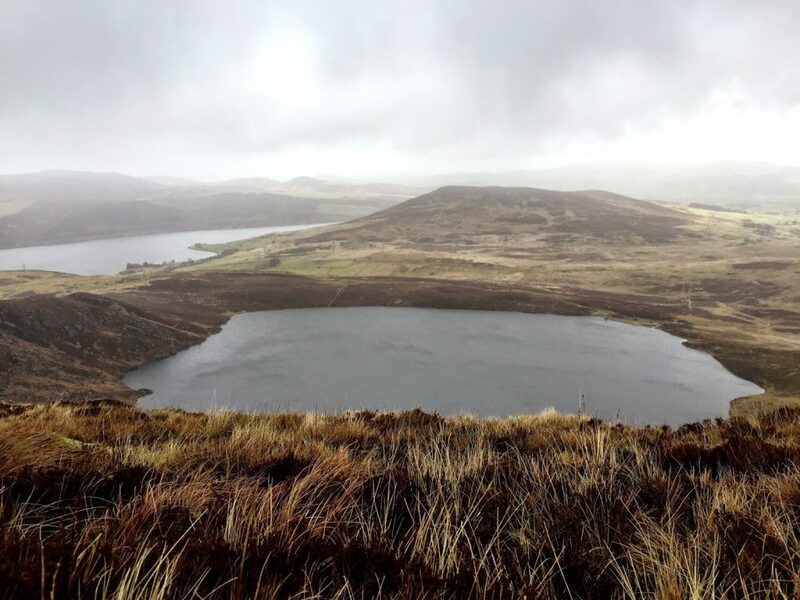 I’d seen no other soul in 24 hours – unsurprising when the foothills of Arenig Fawr are a pathless, tussocky bogfest that sap the life and energy from your limbs with every squelchy stomp. Thermarest NeoAir Xtherm mattress – its first outing and it was noticably warmer than my regular Neoair Xlite for little weight or size penalty. It’s slightly beefier fabric meant I found it comfier and less crinkly too. Unless you are really counting each and every gram I’d recommend it as a full-time alternative to the standard Neoair. And I managed to pick it up in a sale for same price as the Xlite. Kovea Spider stove – I took this along with my MSR Titan kettle rather than my JetBoil. A folded Kovea fits perfectly in the bottom of the kettle (though not with a gas canister). A pre-heat tube allows it to be used with an inverted canister in winter. Compared to my JetBoil, the boil time was much slower, though stupidly I forgot to invert the canister to see if it had any effect. The Kovea and Titan kettle is a more stable set-up than the taller Jetboil. I’ll happily take it out again. Perhaps a windshield would help keep the heat in and improve boil times.